One fish. One drop of water. Both are an important part of a larger story. Both represent a moment in time for the Deschutes River Basin. But the story doesn’t end with what we learn from studying that fish and that drop of water. It flows, over time. It evolves. It includes the needs of local tribes and the community. The Deschutes is important to all of us, and at PGE, we understand that our efforts have to follow the entire story of the river: the environment, the science and the people who rely on it. Which is why we’re adapting what we do, always working toward the goal of helping to maintain a healthy river with healthy fish for generations to come. The Deschutes River has been a part of the heritage and livelihood of the Confederated Tribes of the Warm Springs Reservation of Oregon for thousands of years, and the Tribes continue to rely on the Deschutes as a mainstay of their economy, their cultural and social needs and their very way of life. The Tribes share the Deschutes with all Oregonians, generously providing open access for fishing, recreation and more. 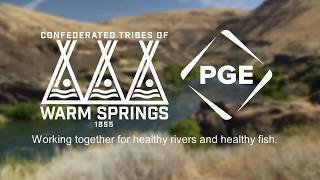 PGE is honored to work with the Tribes as they plan in 100-year cycles, helping to ensure this vital natural resource is protected and restored, for current and future generations. By following the Tribes’ lead and sharing their vision, we can be sure that our solutions are not only based in science, but also anchored in the wisdom and knowledge of tribal elders. So we can honor the hope of the tribal youth and work to meet the needs of future generations of the tribe — and all Oregonians. To follow the science of the Deschutes, our biologists and researchers monitor multiple sites on the river, year-round, measuring changes. This helps us understand the health of the river and how several variables, including rainfall amounts, winter snows, and hot summers affect the water quality over time. We are analyzing this data to better understand how the river is changing, so that in collaboration with fish and wildlife agencies, water quality regulators, and non-governmental stakeholders we can continue to plan for long-term river health. Long-term results require long-term solutions and steady, consistent commitment, evaluating progress over time and making thoughtful course corrections when the science supports them. We’re celebrating some early success, including the fact that for the first time in 50 years, adult salmon and steelhead are making it upstream, swimming more than 200 miles to spawn. But we know we still have a long way to go. The only way to ensure we meet the long-term goals for the health of the Deschutes is to continue to follow the science, adapt as the river changes, and continue strong partnerships with our resource managers, the Tribes and the community. Read more about our commitment to the Deschutes River Basin. The project also provides jobs and pays taxes in central Oregon, and additional support through community donations by PGE, our employees and the PGE Foundation. That support totaled more than $55 million in 2016 alone. The Tribes provide additional economic support through job creation and economic development. 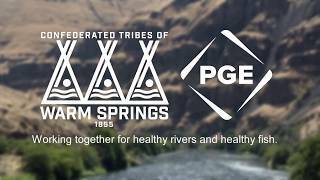 PGE is committed to the health of the river for fish, Tribes and all Oregonians. To help deliver on that responsibility, we created the Pelton Round Butte Fund. Together, with the Tribes, we’ve supported more than 45 habitat conservation projects on the Deschutes River, pursued and often jointly funded with many other local partner organizations. These projects include removing fish passage barriers, stabilizing stream banks, restoring channels and floodplains, and conserving water. From 2005 to 2020, the Pelton Round Butte Fund will spend a total of $20.5 million on these efforts. Learn how we track native salmon and Kokanee to their spawning locations. We use science-led decision making to manage our work in the Deschutes River Basin.